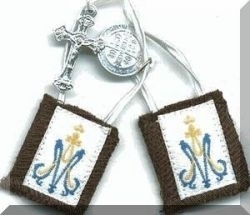 This small brown scapular is made from 100% wool. It includes a St Benedict medal, crucifix, and a pamphlet that explains the history and use. Choice of brown or white cord. The small size of 1" x 1.3" is appropriate for children and First Communion gifts.